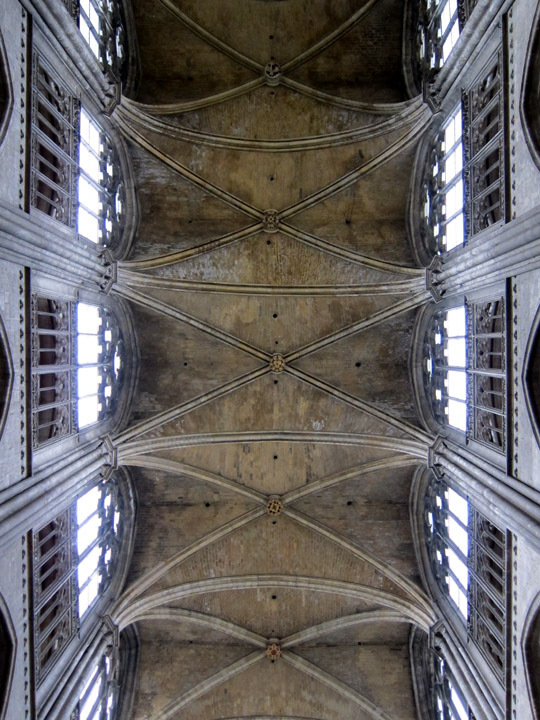 A list of the greatest Gothic Cathedrals in the World is going to be dominated by the French greats: Notre Dame, Sainte-Chapelle, Chartres, Amiens, Riems and Rouen. Since cathedrals, with their cavernous interior space and organic ribbing, are places to be explored and experienced, I always make time for a long visit! Rouen Cathedral in Normandy is a spectacular example of the High Gothic (mostly) style and well worth gazing at and wandering through. Main aisle of the Rouen Cathedral. 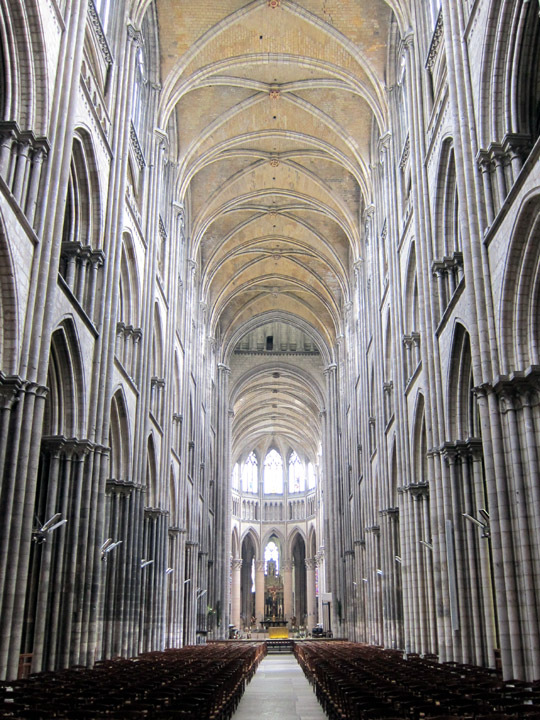 The 12th century Early Gothic beginnings of the Rouen cathedral were destroyed by a fire during construction. 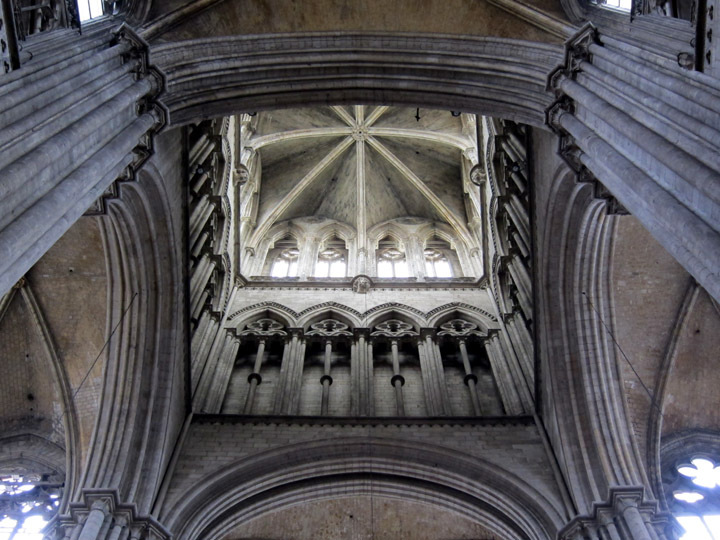 The side aisles, central vaulting and choir date from the 13th century and are considered the High Gothic style. This means there is more emphasis on windows and creating seamless vertical lines. I was impressed with the fine columns that lined each major structure element giving the interior a very delicate appearance. 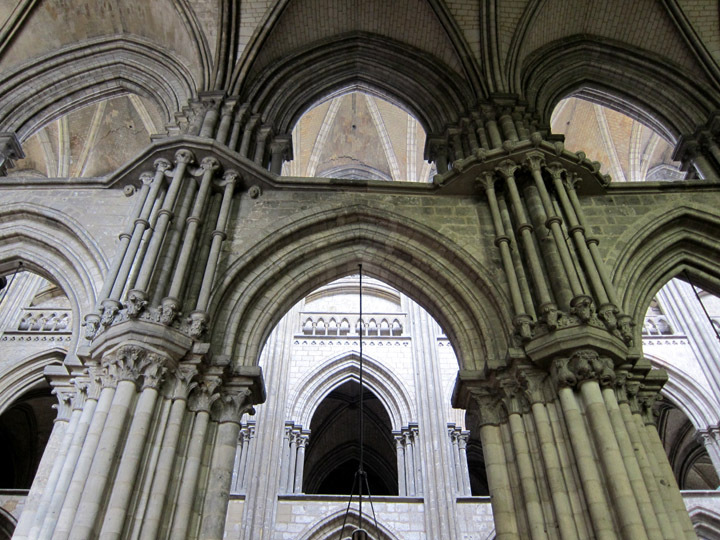 I also liked the balance of the two major registers of arches along the nave and the openness that this created. 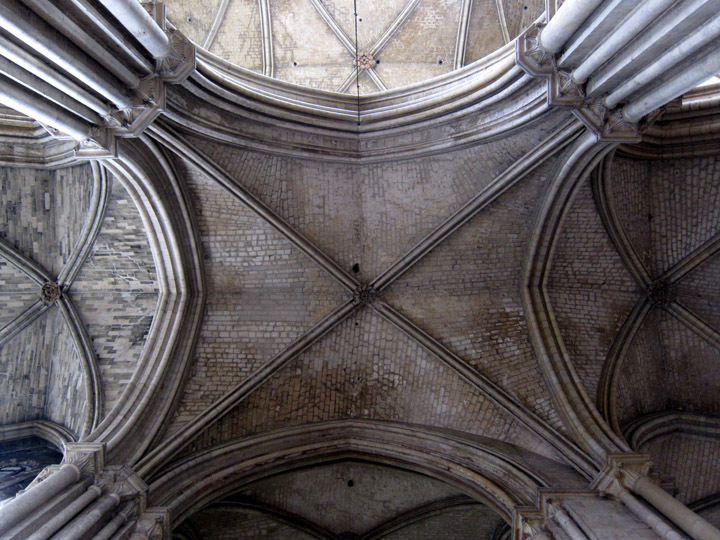 Ceiling of the central crossing. Just north of the crossing is an ornate 16th century staircase known as the Escalier de la Librairie (Booksellers’ Stairway). The cathedral clergy had a library on the second floor of the adjoining building and wished to have easy access to it from the Cathedral itself. Guillaume Pontis designed and constructed this elaborate solution. Interestingly, there was also a book market on the north side of the cathedral which is this is known as the Booksellers’ Stairway and not as the “Library Stairway”. 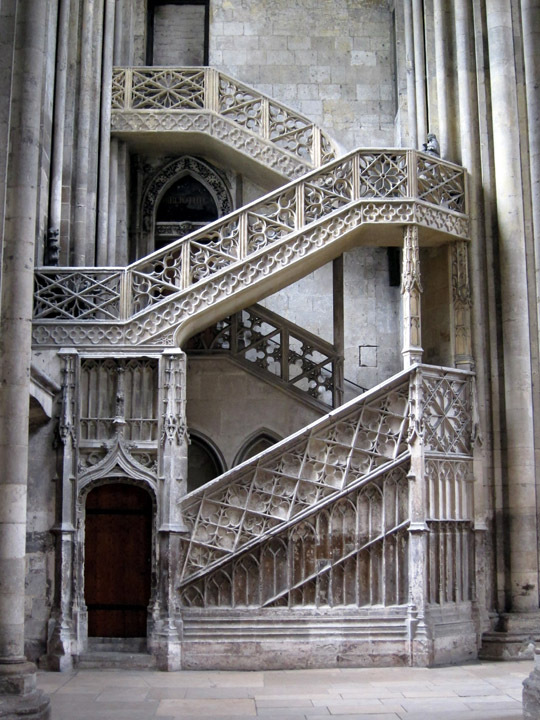 The 15th century Library staircase designed by Guillaume Pontis. 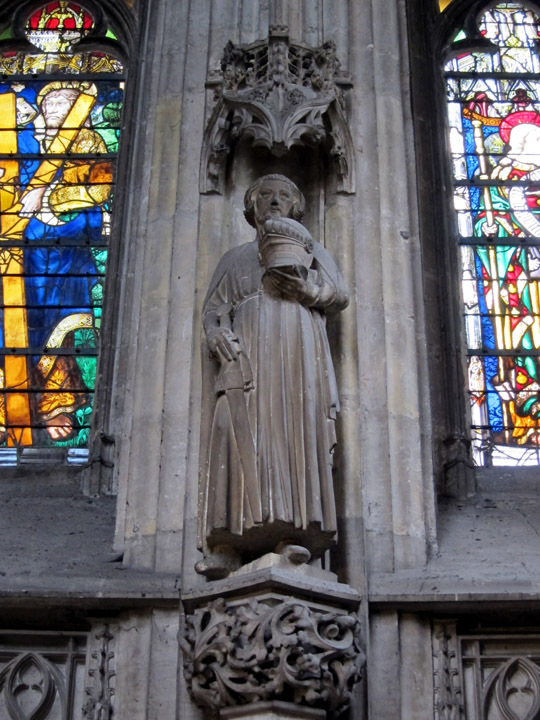 While there are some nice sculptural tracery elements, the statuary is minimal inside the cathedral. In fact a few many warn-looking, 7ft tall statues from the facade have been moved to the choir for preservation and decoration. The small chapels along the right side near the front entrance are largely undecorated or contain art from other local churches. 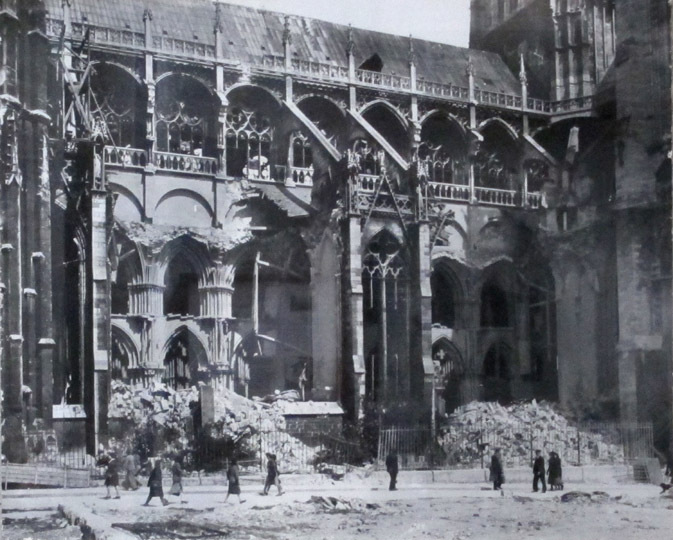 The South side of Rouen Cathedral was almost completely destroyed by Allied bombing in World War II. The cathedral took several direct hits but luckily the massive central pillars were unharmed. The reconstruction is exquisite. The only break in the continuity of the cathedral interior today are the bare side chapels with their plain glass windows, One houses a small exhibit on the history of the cathedral. The restored right side aisle is fully incorporated into the cathedral. 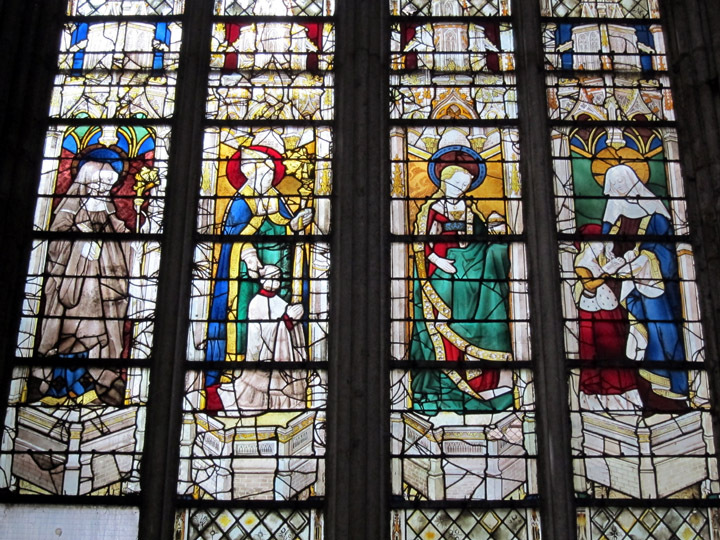 The stained glass windows in the Rouen Cathedral span several centuries beginning with the 1200’s. What a magnificent stairway; it’s also incredible to imagine the meticulous process of piecing it all back together after WWII. Thanks, the staircase was an unexpected treat. I’m just amazed the cathedral came that close to complete destruction but survived. Other churches weren’t quite so lucky. How much of the building is original High Gothic? Thanks! That stairway was such a surprise! After the bombing, the choir, nave and left side aisle are still original High Gothic. The altar area is a little earlier but because of a fire during construction most of the core of the church was done in High Gothic. Gorgeous! 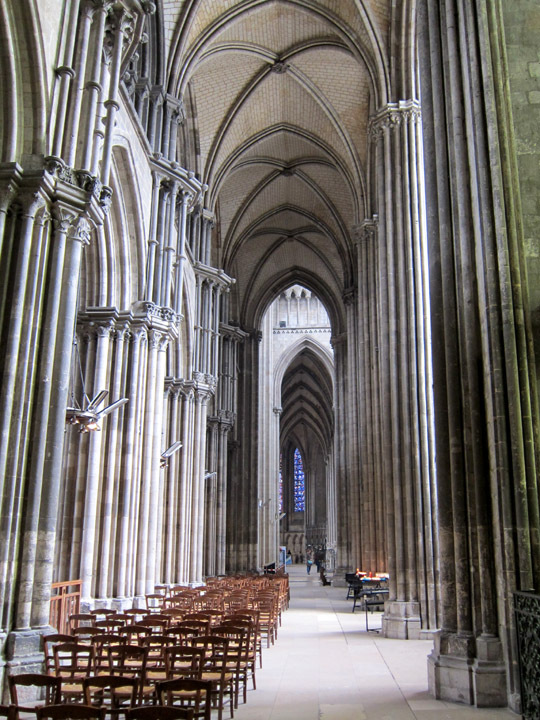 Cathedrals are one of my favorite places to visit in the world, and I agree that some of the nicest ones are in France.